Following the ringing and atlasing workshop at Barberspan I spent 4 days in Nelspruit to ring weavers with Rev Don Williams, prior to attending the BLSA annual meeting. My target was to handle more tropical weavers. 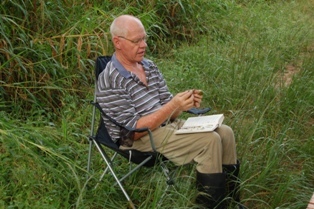 Over 250 weavers (including bishops and widows) were ringed at two sites - Hall's Gateway (15 and 17 March) and Nelspruit Nature Reserve (16, 18 and 20 March). 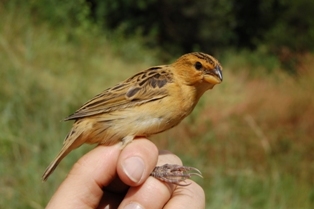 A total of 9 Ploceidae species were caught, showing that Nelspruit is a good place for weaver (and bird) diversity. PHOWN Virtual Museum records from this trip may be viewed here). A large proportion of juvenile weavers was caught. 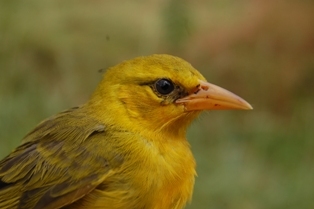 Three species had good numbers of adults and more juveniles than adults: Spectacled Weaver (84% juveniles), Golden Weaver (67%), and Thick-billed Weaver (51%), indicating a very good breeding season for these species. Juvenile weavers all have brown eyes and may be difficult to identify, but there are subtle clues to look for, e.g. 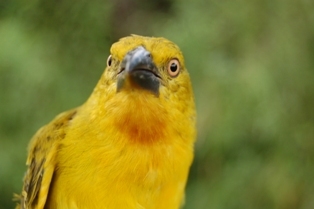 Golden Weaver has a long tail, and Village Weaver has a greyish back. 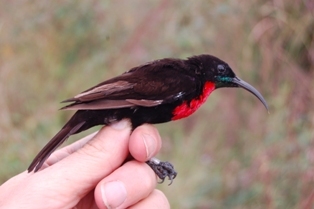 Many Southern Red Bishops were caught at Hall's Gateway and these were found to be smaller than those in many other parts of South Africa. The two sites that were ringed at, also produced some other interesting species, particularly a juvenile Cuckoo Finch. 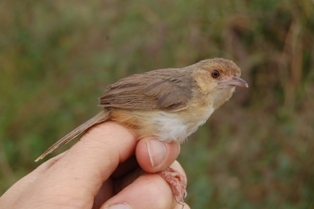 The hosts were probably Red-faced Cisticolas, several of which were caught in the same net. 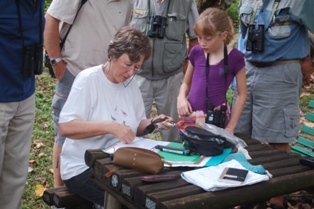 The BirdLife South Africa annaul meeting was held from 18-20 March at Bundu Lodge outside Nelspruit. On Saturday there was a ringing demonstration at a small dam on the estate - few birds were present. 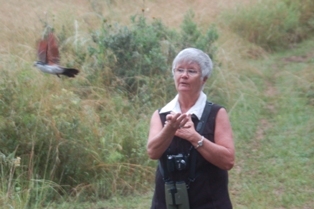 On Sunday morning a ringing demonstration was held at the Nelspruit Nature Reserve near the Impala Road entrance. Don Williams and Peter Lawson spent time before my arrival searching for suitable ringing sites. Thanks to Don and Brenda Williams for their hospitality! Don provided ringing equipment, helped with the ringing and had organised permission to ring. Thanks to Hugh Mooney for permission to ring on the Hall property. Thanks to TRAC Nelspruit for an 'afdak' and toilet facilities while ringing!